January 30, 2014 – Bbrrrr…It’s COLD!! I love working with wool. 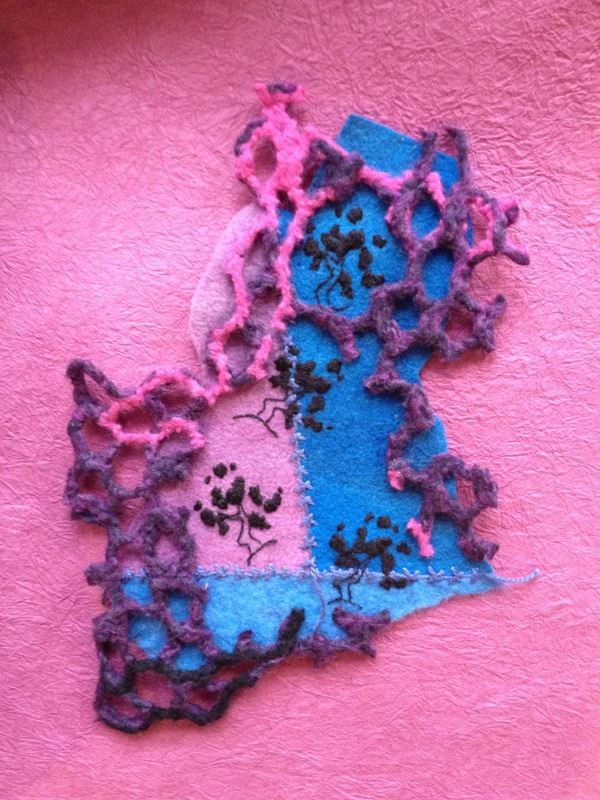 Recently another felt-maker I know wrote to me saying that no matter what other medium she experiments with she always comes back to wool. Me, too. And I especially love working with wool this time of year. It sure has been a cold January. The only good thing about the weather is that it’s kept me indoors. So I’ve been doing lots of stitching. I finished another “small piece” that really has outgrown my definition of small. Once framed it will get to move to a different part of my collection; it’s too big to be small. The fascination with layers continues to haunt me. Years ago I started exploring the idea of layering imagery in my work with a series I called “Mazes”. 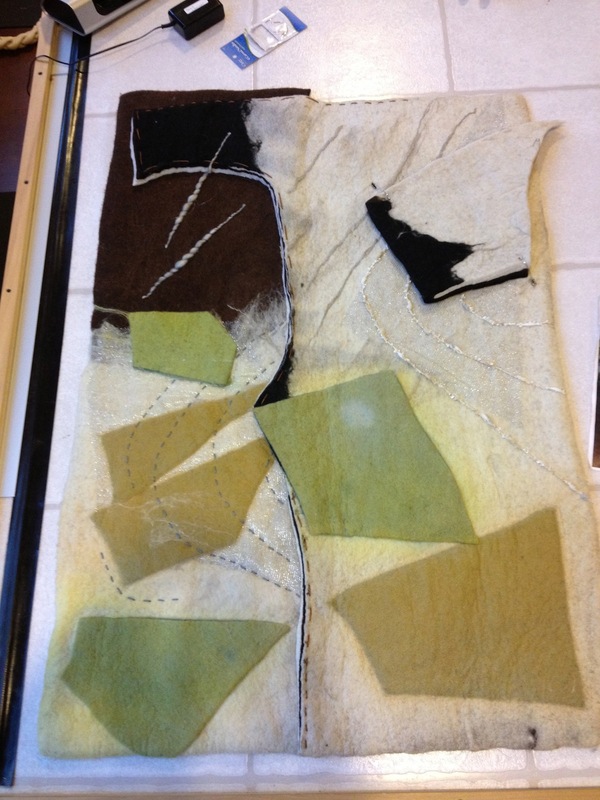 I layered fabrics and stitching. I was a bit timid with it all and when I look at those pieces I smile. Very timid. As I return to exploring layers (maybe I never left) I am getting bolder! 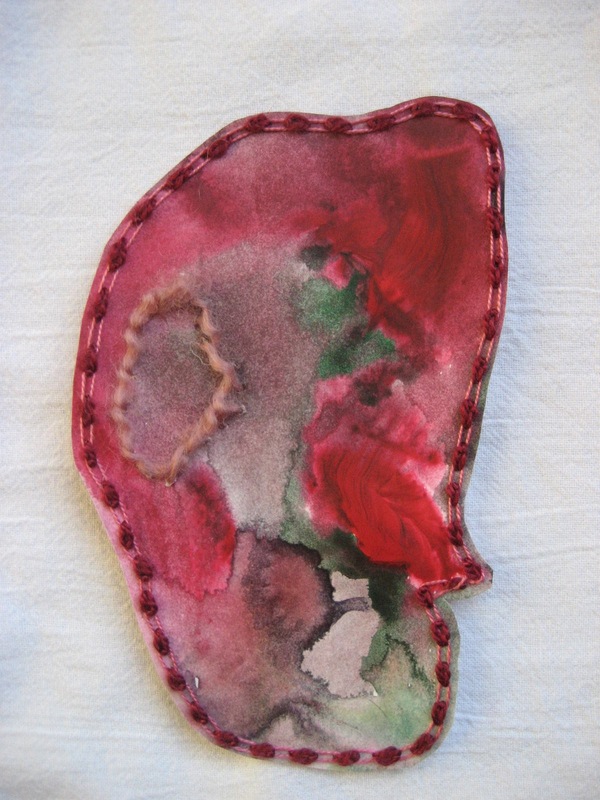 Here’s that outgrown piece when it was pieced and embroidered. This is before it got too big to be small. I’ve started my exploration of tree imagery. How many different ways can I capture the idea of a tree? What happens when I play with shape? Texture? Color? Materials? Does the eye (and mind) still see “tree”? When does it stop seeing “tree”? How much distortion does it take? Some of the same questions the cubists were asking; and answering. Now I layer a grid onto it. Are we playing hide and seek? Camouflage? Or am I adding emphasis, as in a frame? I’ve started to explore a new and fun technique. Well, new for me anyway. I am stitching on paper. I have a felt piece that I will be embroidering upon. Then I want to add stitched paper to it. 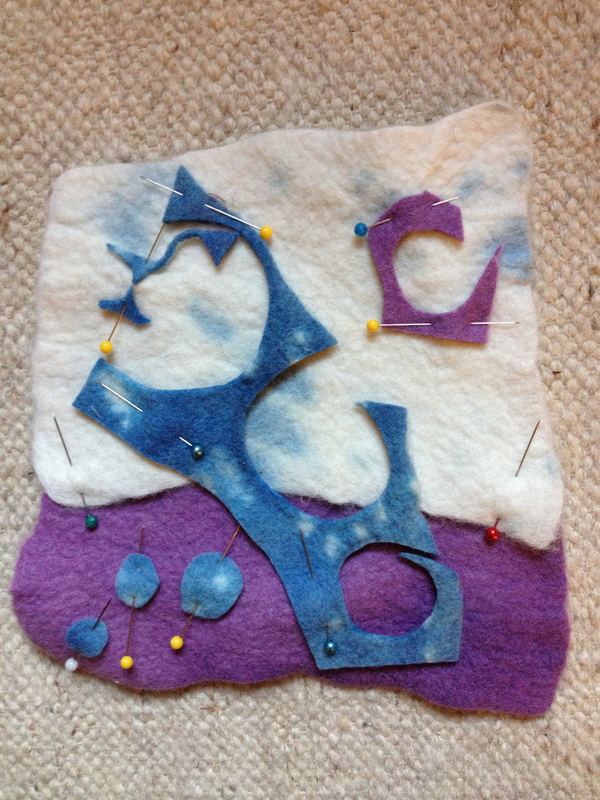 Integrating stitched paper into a whole other felt piece is foreign to me. I feel as if I’m all thumbs. I am totally unsure of how to go about it. As I was thinking about this project, trying to decide how & where to begin, it occurred to me that I might be approaching it backwards. I need to feel comfortable with the stitched paper. To learn it’s subtleties, moods, unique characteristics. So I picked up a piece of paper I’d painted, and really liked, and decided to stitch that. 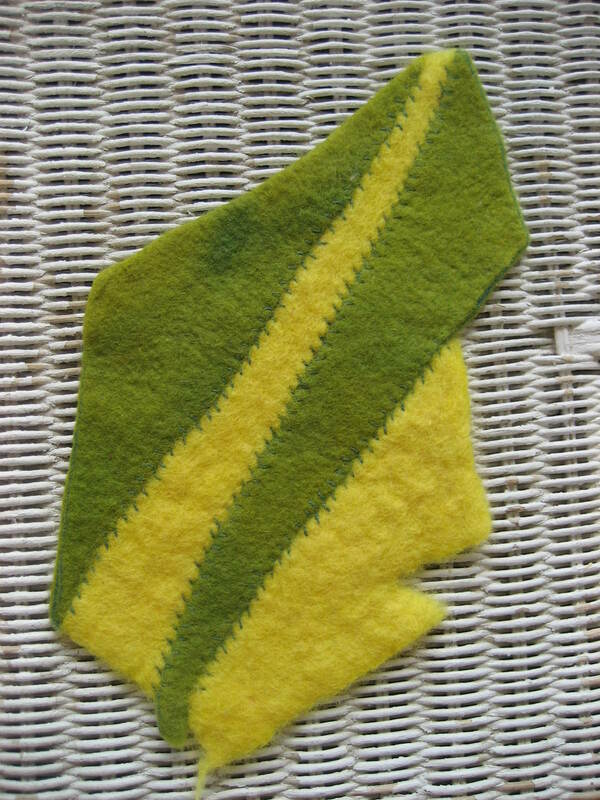 Then I will create a piece of felt to go with it. I am hoping this approach will aid in increasing my comfort level and give me ideas of how to proceed. It started out rectangular. I painted it with acrylic paint. 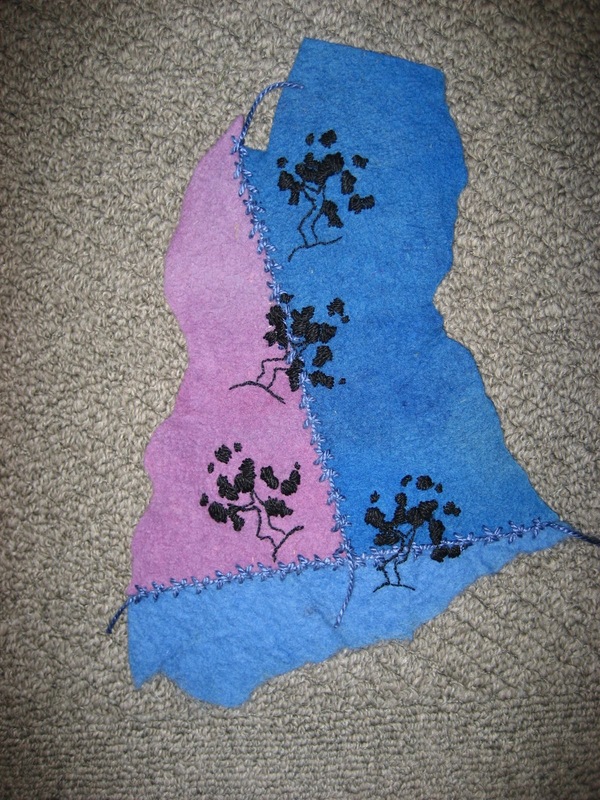 Then I cut out the shape to (hopefully) enhance what I saw and how I wanted to stitch it. I’m going south for the month of February. I’ll return riding on the back of spring. Stay warm! I’ve been working away on more of the small pieces that I’ve been sharing with you. They can be challenging while still being such fun. I’ve strayed far from the original idea of circles and colors from yellow to blue on the color wheel. My parameters have stretched, or been thrown out altogether. Today I was actually thinking about placing parameters on myself again to see where it might take me. In the meantime, here’s a piece recently framed and hung. First I’ve a photo of what I’d initially thought of and pinned together. My design process develops and changes as I work on each piece. 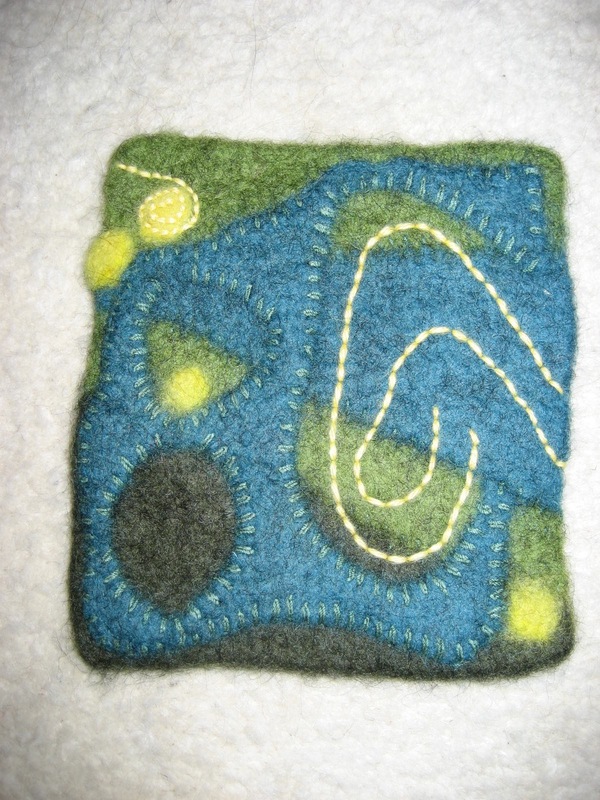 I am playing more and more with stitching, which so totally changes what needs to be added, or subtracted. Here it is finished and framed. No flash was used here and the color is a bit washed out, but there is no glare. Here I’ve used a flash. You can see a white circle right in the middle of the piece that shouldn’t be there. And more glare from the glass. But the colors are richer. I had a manicure yesterday. It’s something I do on occasion; a special treat to myself. I picked out this wonderful purple – eggplant really. Got back to the studio and what I saw made me laugh out loud. My nail polish color appeared in 2 of the pieces I’m currently working on. Might I start a new trend? Nail polish to match artwork? This piece is in the process of being framed as I write this. The actual background color is more muted and grayed out. Funny things the flash does to color. This piece is far from done. 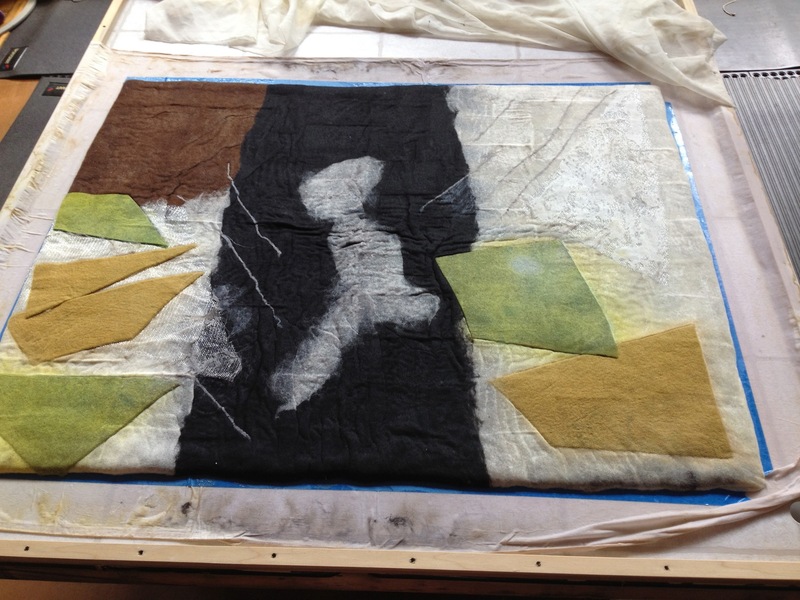 However, I chose the next step – layer really – today and am excited to get it sewn on and see where we go from there. The stitching on this piece is quite strong. How to add a layer that allows the stitch it’s own power, and yet partially conceals? Stay tuned and you’ll see….. 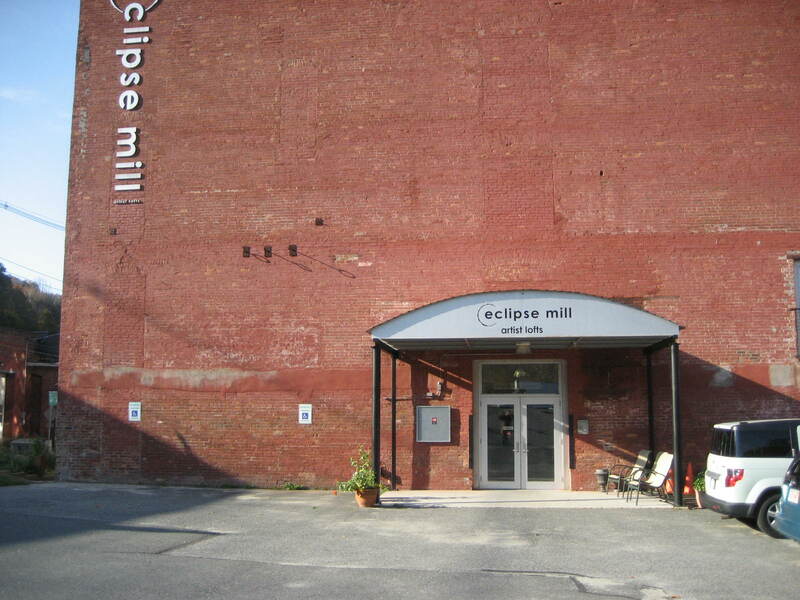 This past weekend was the North Adams Open Studios. This event, while taking place the same weekend of October for the past 8 years, has expanded, contracted, and perhaps now stabilized. Like the event itself, I have “expanded” (participated), “contracted” (kept my doors closed), and perhaps now “stabilized” (participated once again). Prior to agreeing to participate I waffled. Yes, no, yes, no — and finally YES! And I am so glad I opened my doors. I had a lot of fun. 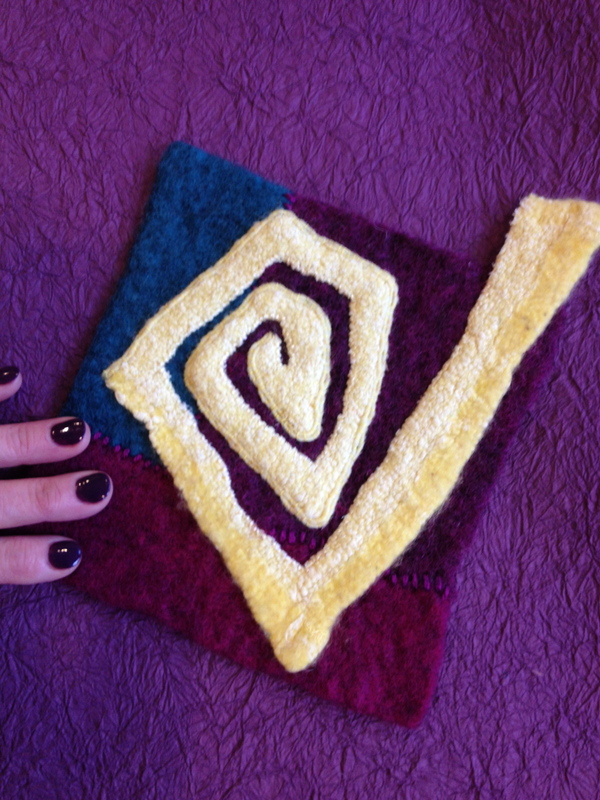 It was great talking to those people who chose to be engaged, and sharing bits and pieces of the felt-making process with them. It was great to see people walk through, take a look, and choose not to engage. I was able to work on a variety of small projects over the course of the weekend. 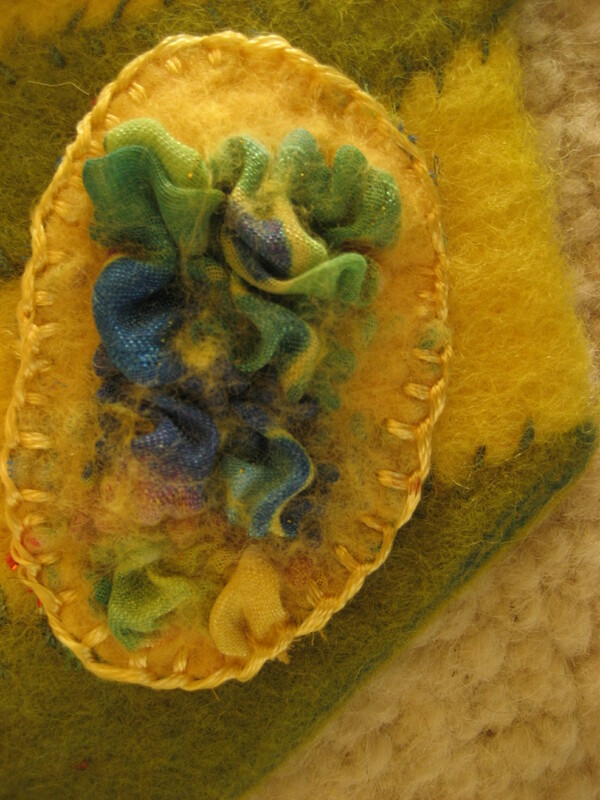 The whipping cream this year was that I sold quite a bit of hand made felted articles. That’s such a wonderful affirmation of my work. I started out taking some videos with my camera. 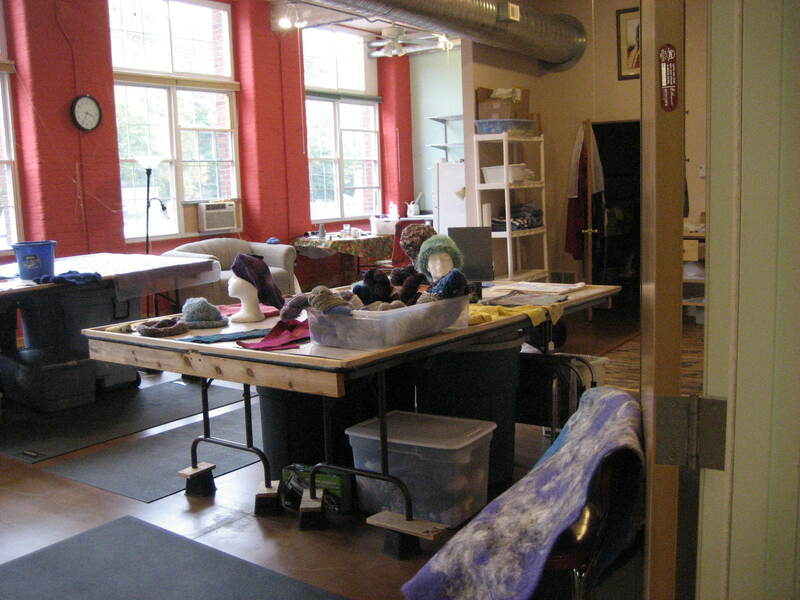 I was inspired to make a video by Luann Udell, blogger and artist extraordinaire, who made a video of her studio prepared for Open Studios a few weeks ago. Then I got nervous, since I’d never taken a video before, becoming sure I’d mess it up. So I turned off the video. I just now reviewed my footage and regret not having continued. I think I’ll learn more about taking and editing video so I can offer that to you some time. Instead today I’ll show you some good, old fashioned photos. Here’s a shot of my front door, open and welcoming. 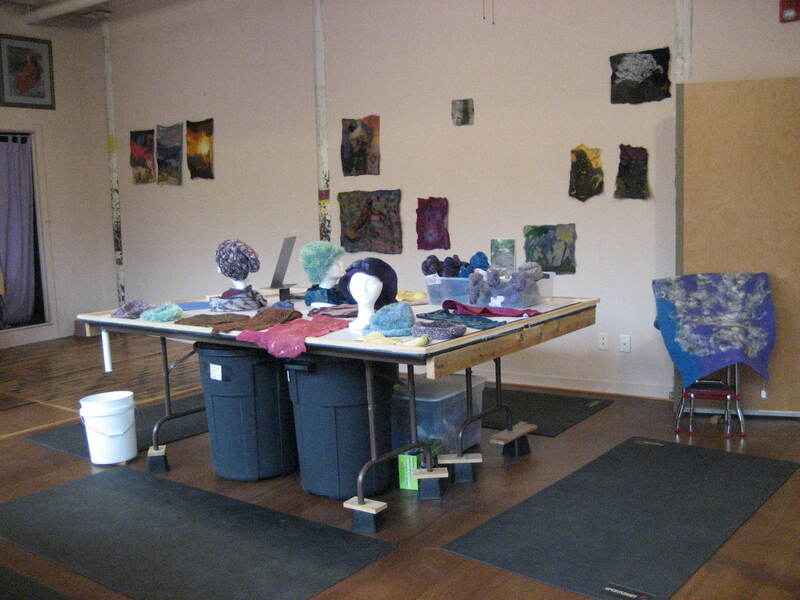 You can see the table with items for sale and in the back one of my work tables. Here’s the “items” table again and behind it my “think” wall. 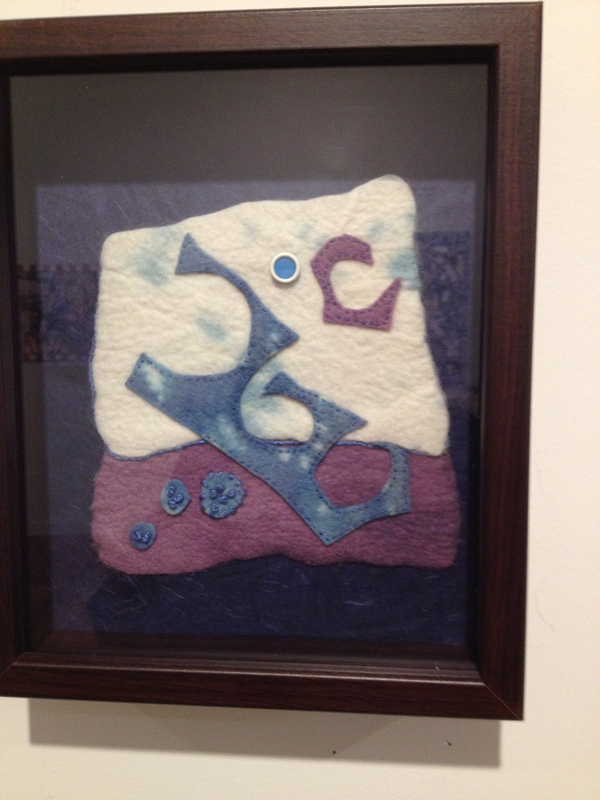 This is where I hang pieces that have been felted and now need further work. Embellishment of some kind, which might be stitching, beading, additional fabrics — or all of those. 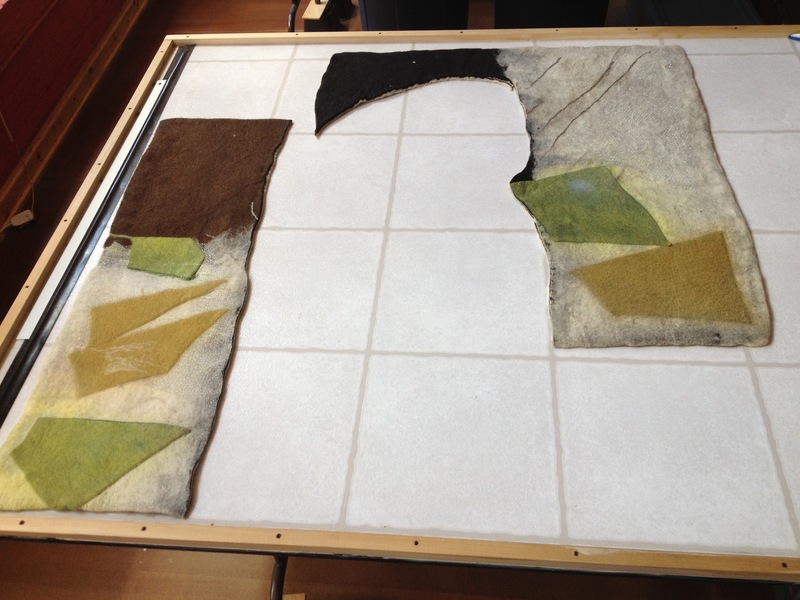 By the way, the table is one of 2 of my felting tables, especially designed by my Finnish friend, Rod Welch. It has a drain in one corner with a 5 gallon pail underneath to catch the run off. All of the other corners are elevated higher than the drain corner. The surface is a vinyl flooring w/ some texture to aid in the felting process, and a lip around the outside to keep the water contained until it runs out the drain. It’s a great table and has saved me hours of sucking up water with a wet/dry vac. Under the table are plastic garbage pails for storing batts of fleece. 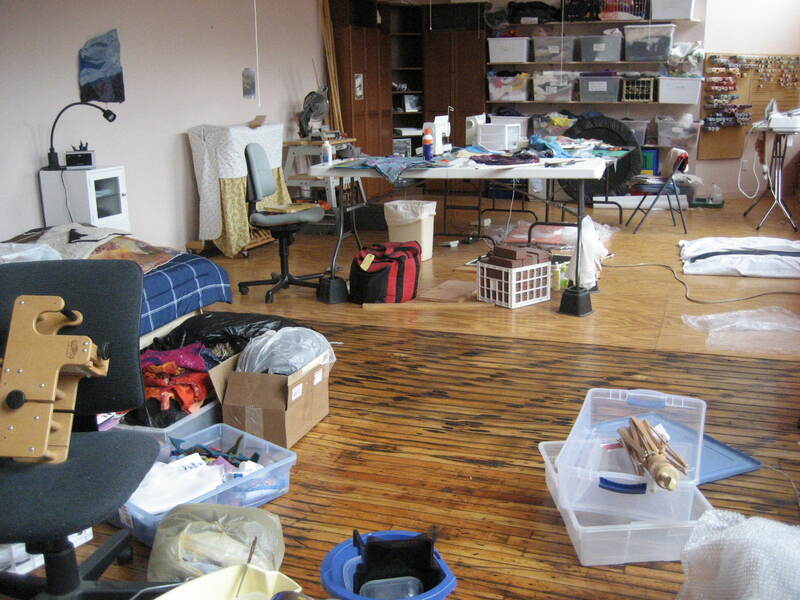 Now, I don’t want you to think there is something un-natural about the way I work, so here’s a peek into my back room. It’s a little messier than usual (though not that much) ’cause I dumped quite a bit of the stuff from the front room in there and just closed the door. An easy way to “clean up” when in a hurry. I am loving the orderliness of my front room so I have promised myself to slowly bring the back room into a similar order. Then I can start working and revert to my messy self! When I’m in the grip of creativity the last thing I want to do is spend time putting things away. One last treat. 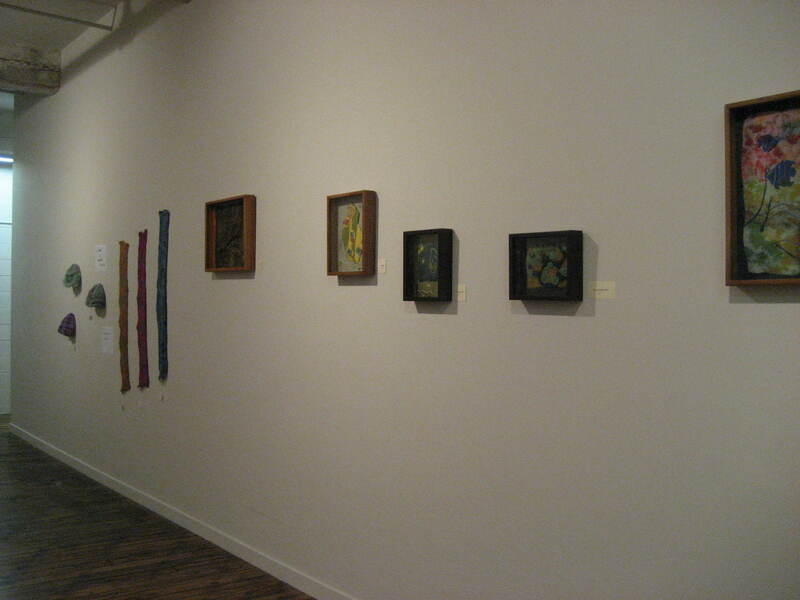 A glimpse of work hung on the hallway outside my studio. September 21 – Happy Solstice. I have actually been working since my last posting. Slowly, but steadily. The first 2 pieces were sent off to Seattle at the beginning of the month once they were complete and mounted. Today I have 2 finished pieces to show you. Both were started, and pictured, in my last posting on August 7th. Here’s the yellow and green one. 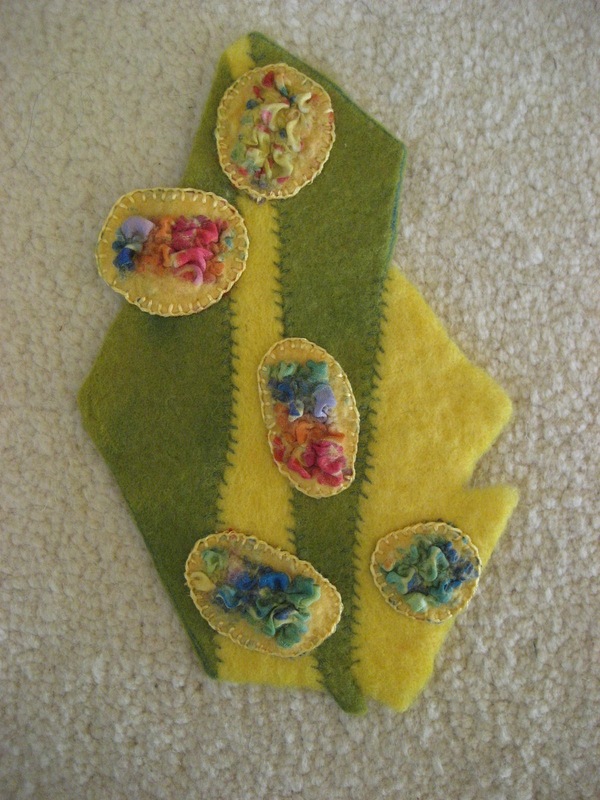 It seemed to take forever to edge the circles on it using blanket stitch. The real challenge was using all 6 strands of embroidery floss together and not have it knot, tangle or separate. I was not always successful. However, I am pleased with how it turned out. I like the shiny edge the embroidery floss gives the embellishments. And a detail. Unfortunately the color in this photo is lousy and not at all true. By the time I finished hardening this last piece I was hooked. As this piece was going round and round on the roller I put together ideas for an additional 6 pieces. It’s such fun and the ideas are just pouring out of me. 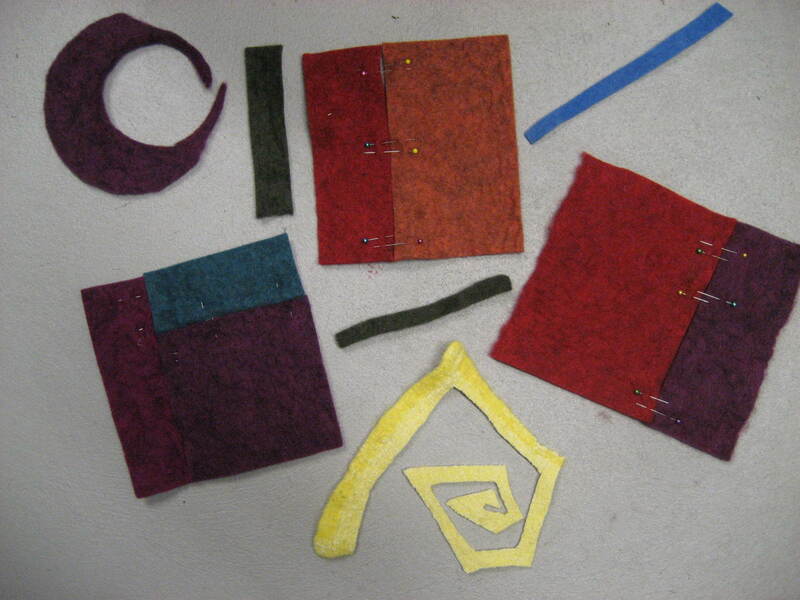 The hardening and stitching are the time consuming parts of the process. Here are some bits and pieces to wet your appetite. Can you guess what pieces will be used together? If not, tune in again and see. After so many months I seem to have found my muse once more. So much has been happening, including my returning to school, this time for formal art education. 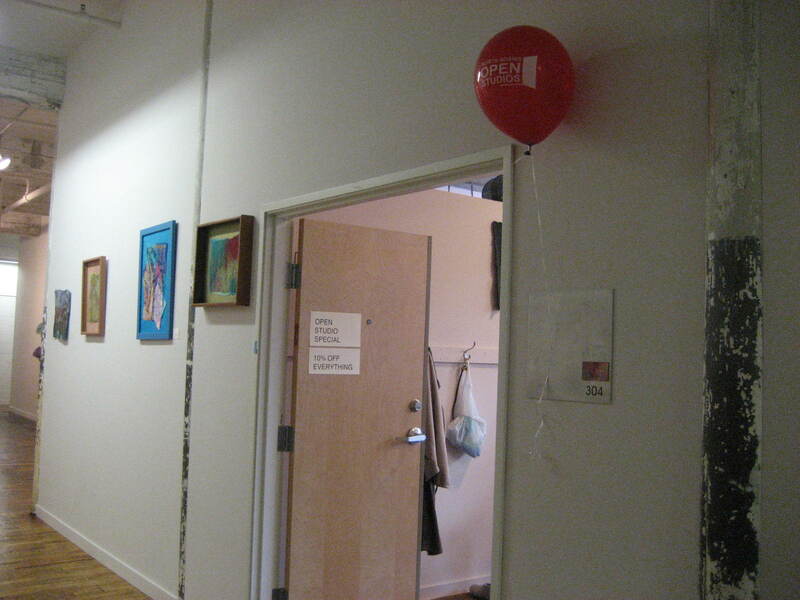 I am fortunate enough to have become a student at the Gail Harker Center for Creative Studies. 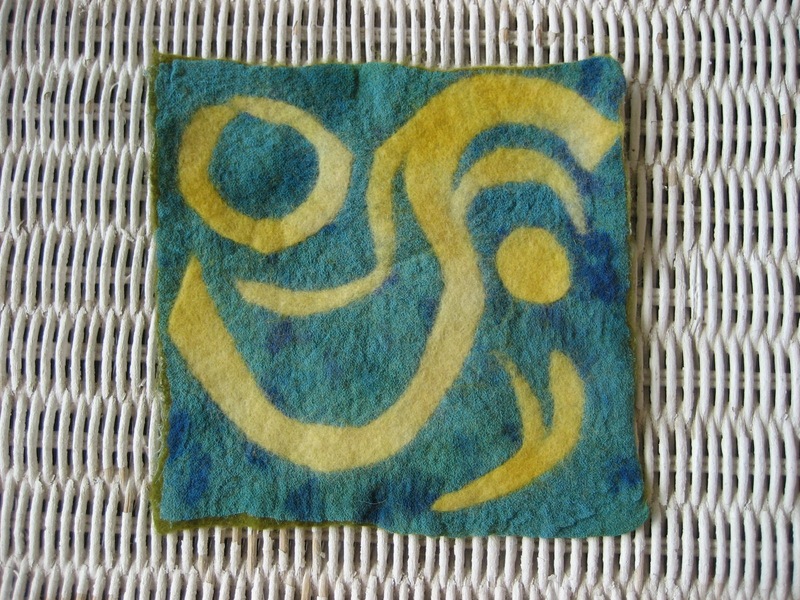 As one of Gail’s students I have been offered a challenge: create a 6 inch square piece for an exhibit and auction. The theme of the piece must be circles and the colors are limited to those within the color wheel from yellow to blue. Of course I’ve accepted the challenge, and what fun! I thought I’d share the pieces I’ve begun, each of them being far from completed. 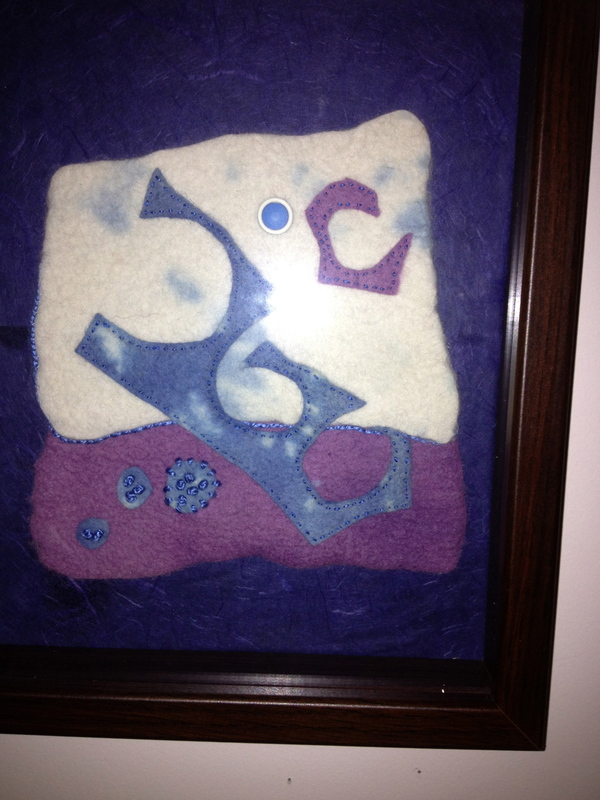 The first piece I did was a nuno piece using a funky knit synthetic face cloth with silk shapes felted on top. Because the face cloth is a synthetic the edges of the silk didn’t stick very well despite the layer of wool I put between the 2 fabrics. So I decided to couch a heavy-ish thread around the edges of the shapes. 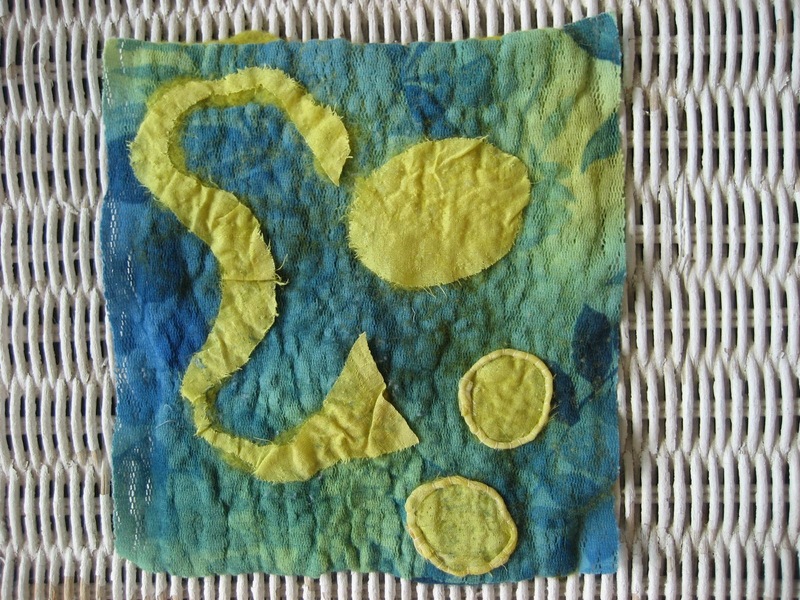 This has the effect of both defining the edges of the shapes as well as holding the silk in place. In the picture below you’ll see the beginning of the couching. The” heavy thread” is actually the rolled edging from a very light weight silk chiffon scarf. 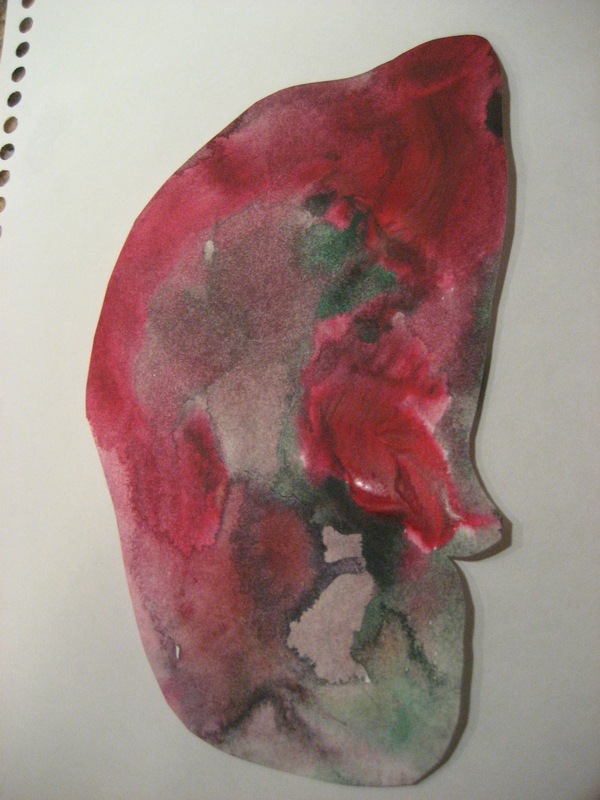 The second piece I’ve made is also nuno, with a hand-dyed silk face cloth and wool pre -felts used for the imagery. I like the clean, crisp design they give. Some kind of embellishment will be added I think, though I haven’t really gotten that far yet. In the third piece I tried a technique I’ve been wanting to experiment with for awhile. 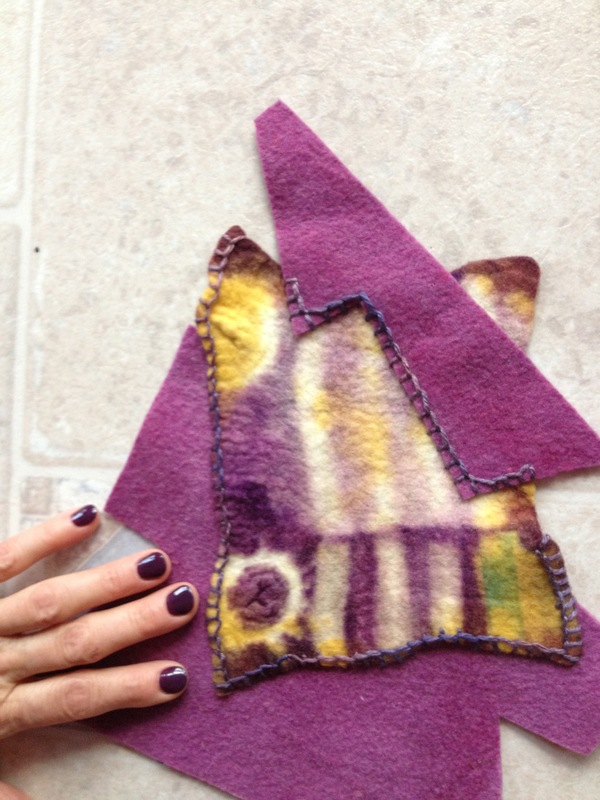 With a wonderful silk thread I have sewn together several pieces of pre-felt. 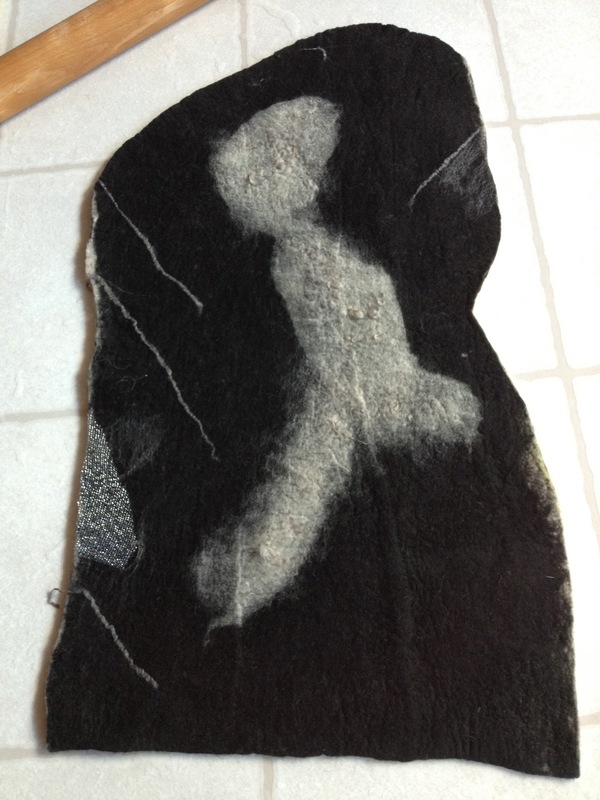 Then I put the sewn sample on my rolling machine and fulled it into a nice, hard piece of felt. 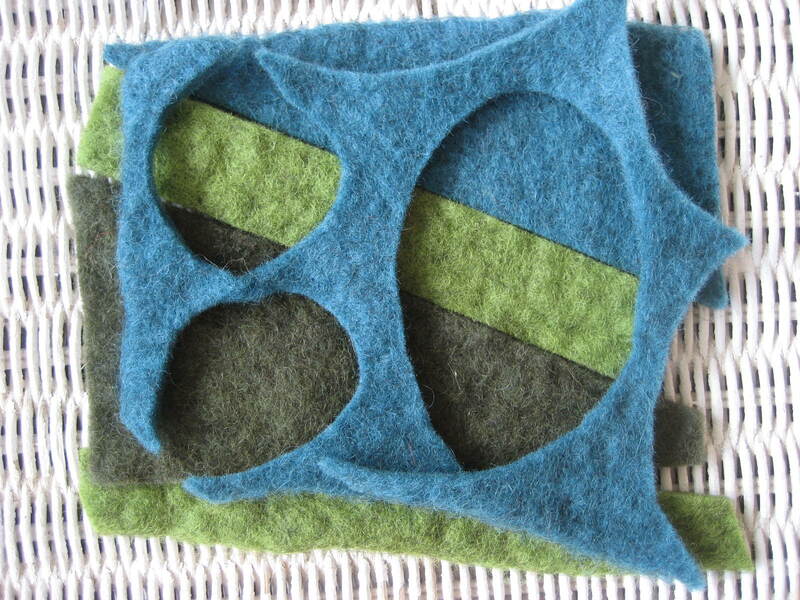 The different pieces of felt merged together into one, rather than being just stitched together. It’s great! Unfortunately — or maybe fortunately, time will tell — I cannot get a 6 inch square out of this sample, so I’ll be using it for something else. But I love the effect; so much has been gained. I think I have just begun to explore these ideas. My notebook has several more series akin to this. Sometimes limits and boundaries are — not limiting — but just what is needed to give birth to many, many new ideas! “This is just awful! Did I really make that horrible thing?” I’m sure you’ve had that reaction to a piece of your work at one time or another. A few months ago, after putting in about 40 hours on a rug, I looked at the finished piece and gasped. It was truly dreadful. What to do? All that time and energy….I figured my choices were to cut it up into pieces and try again, or just throw the whole thing in the garbage. Cutting it up was scary, so I let it sit on my table and haunt me. Now I’ll let it haunt you. I couldn’t quite get my mind around the black piece, so I started with the other two. Overlapping them seemed to work. they fit together well, despite missing the middle. So I started to sew them together. Then I added a scrap from the cutting process. I got some more ideas about stitching, and the more I stitched, the more ideas I got. The piece started to take shape, and it was a shape I liked. Now, almost finished, I am quite pleased. So pleased that I think I’ll try some more of this deconstruction-reconstruction stuff. I’m not talking about the old rope and noose kind of “hanging mechanism” here, but rather how to best display my artwork. For several years my work has been framed. I like it; it looks neat, clean, professional. However, as my work changes, framing no longer meets all my needs and requirements. So I have been trying out various alternatives, with more or less success. Usually less. How much of our time as artists goes into tasks other than actually making art? In my case — and I know I’m not alone — lots and lots. There always seems to be something that needs to be done other than the creative part, whether it’s attending to business, cleaning up my workspace enough to actually do something in there, or convincing myself that what I’m doing is a valuable use of my time.